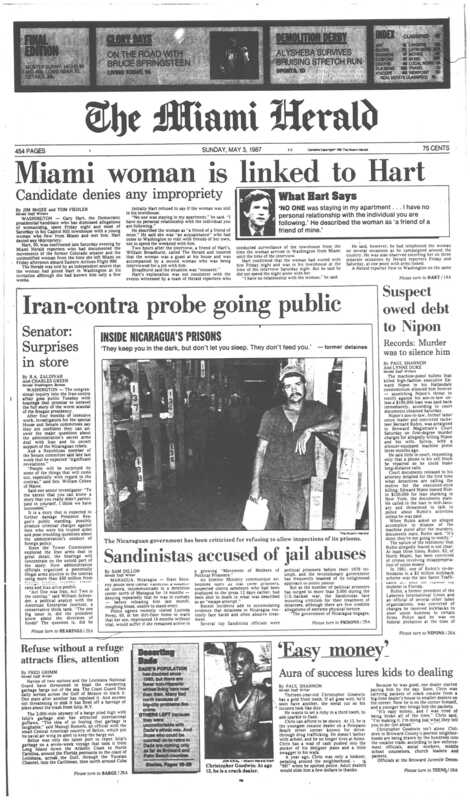 Gary Hart, the Democratic presidential candidate who has dismissed allegations of womanizing, spent Friday night and most of Saturday in his Capitol Hill townhouse with a young woman who flew from Miami and met him. Hart denied any impropriety. 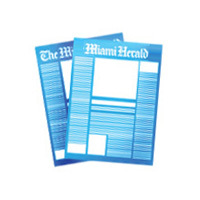 Hart, 50, was confronted late Saturday evening by Miami Herald reporters who had documented the movements of the former Colorado senator and the unidentified woman from the time she left Miami on Friday afternoon aboard Eastern Airlines Flight 996. 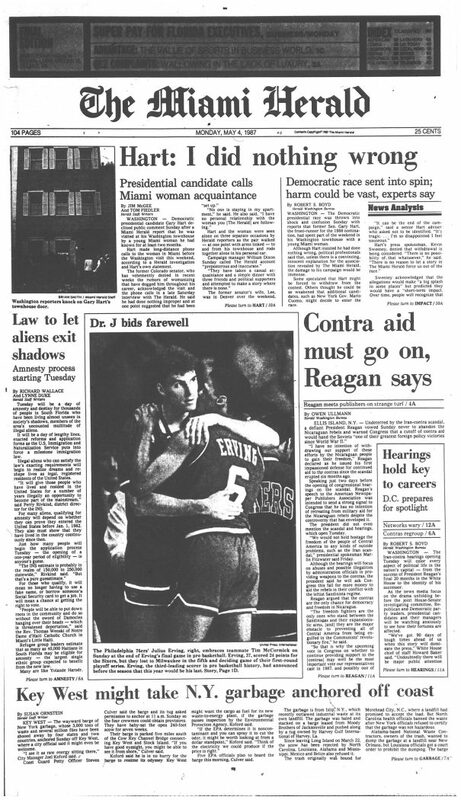 The Herald was told by an independent source that the woman had joined Hart in Washington at his invitation although she had known him only a few weeks. Initially Hart refused to say if the woman was still in his townhouse. He described the woman as “a friend of a friend of mine.” He said she was “an acquaintance” who had come to Washington to visit with friends of her own, not to spend the weekend with him. 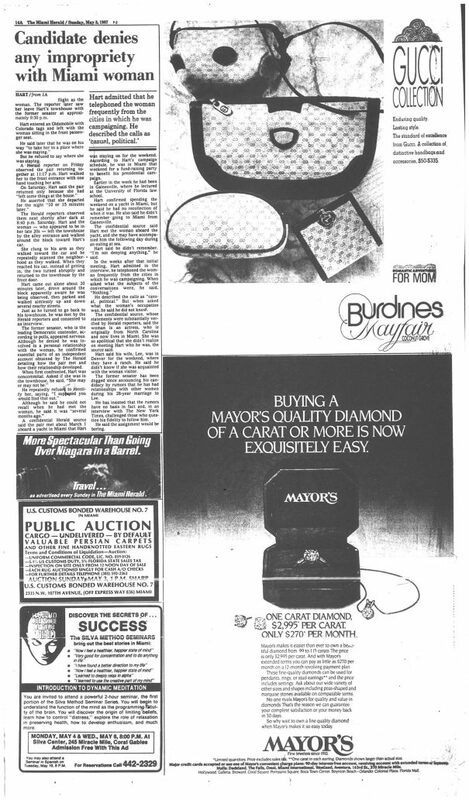 Two hours after the interview, a friend of Hart’s, William Broadhurst, called The Herald and insisted that the woman was a guest at his house and was accompanied by a second woman who was being interviewed for a job with him. 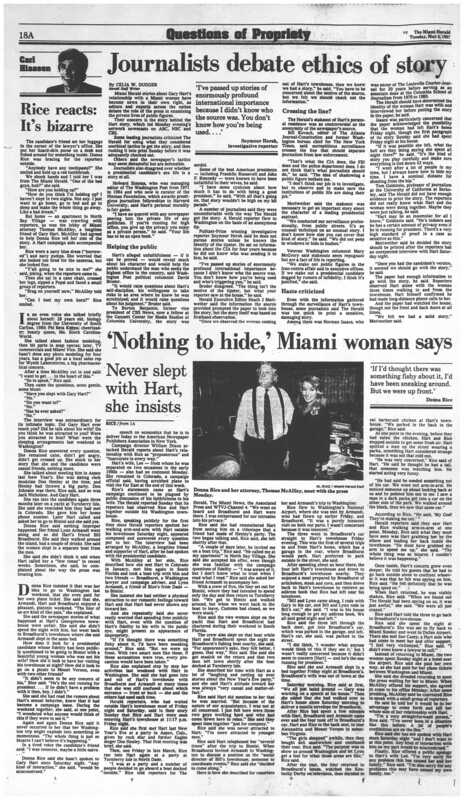 Hart’s explanation was not consistent with the events witnessed by a team of Herald reporters who conducted surveillance of the townhouse from the time the woman arrived in Washington from Miami until the time of the interview. Hart confirmed that the woman had visited with him Friday night and was in his townhouse at the time of the interview Saturday night. But he said he did not spend the night alone with her. “I have no relationship with the woman, ” he said. He said, however, he had telephoned the woman on several occasions as he campaigned around the country. He was also observed escorting her on three separate occasions by Herald reporters Friday and Saturday, at one point with arms linked. A Herald reporter flew to Washington on the same flight as the woman. 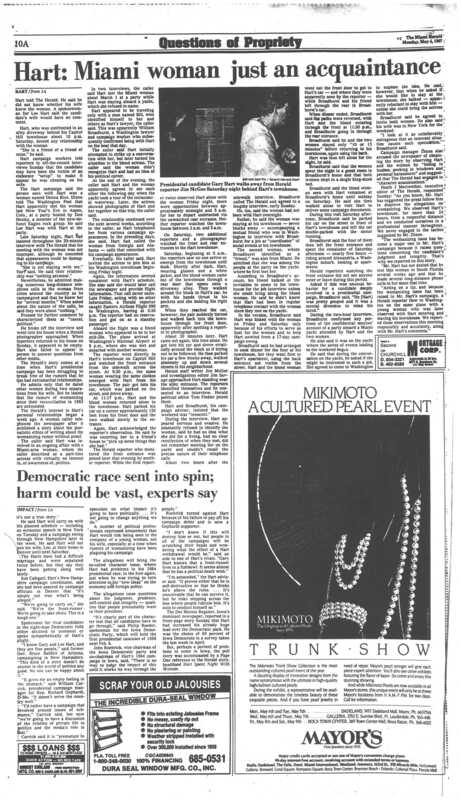 The reporter later saw her leave Hart’s townhouse with the former senator at approximately 9:30 p.m.
Hart entered an Oldsmobile with Colorado tags and left with the woman sitting in the front passenger seat. But he refused to say where she was staying. A Herald reporter on Friday observed the pair returning together at 11:17 p.m. Hart walked her to the front entrance with one hand touching her arm. 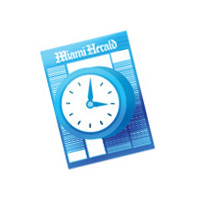 The Herald reporters observed them next shortly after dark at 8:40 p.m. Saturday. Hart and the woman — who appeared to be in her late 20s — left the townhouse by the alley entrance and walked around the block toward Hart’s car. She clung to his arm as they walked toward the car and he repeatedly scanned the neighborhood as they walked. When they reached his car, instead of getting in, the two turned abruptly and returned to the townhouse by the front door. Hart came out alone about 30 minutes later, drove around the block apparently aware he was being observed, then parked and walked aimlessly up and down several nearby streets. Just as he turned to go back to his townhouse, he was met by the Herald reporters and consented to an interview. The former senator, who is the leading Democratic contender, according to polls, appeared nervous. Although he denied he was involved in a personal relationship with the woman, he confirmed essential parts of an independent account obtained by The Herald detailing how the pair met and how their relationship developed. A confidential Herald source said the pair met about March 1 aboard a yacht in Miami that Hart was staying on for the weekend. According to Hart’s campaign schedule, he was in Miami that weekend for a fund-raising party to benefit his presidential campaign. Earlier in the week he had been in Gainesville, where he lectured at the University of Florida law school. Hart confirmed spending the weekend on a yacht in Miami, but he said he had no recollection of when it was.He also said he didn’t remember going to Miami from Gainesville. 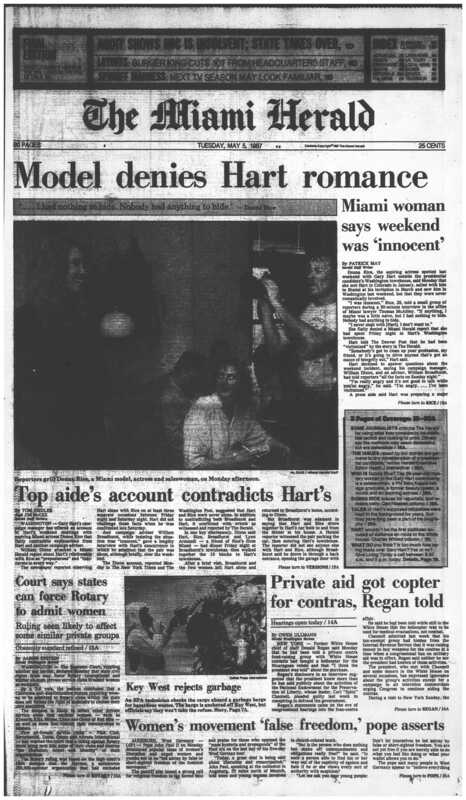 The confidential source said Hart met the woman aboard the yacht, and she may have accompanied him the following day during an outing at sea. Hart said he didn’t remember. “I’m not denying anything, ” he said. He described the calls as “casual, political.” But when asked what the woman’s occupation was, he said he did not know. The confidential source, whose statements were substantially verified by Herald reporters, said the woman is an actress, who is originally from North Carolina and now lives in Miami. She was so apolitical that she didn’t realize on meeting Hart who he was, the source said. Hart said his wife, Lee, was in Denver for the weekend, where they have a ranch. He said he didn’t know if she was acquainted with the woman visitor. The former senator has been dogged since announcing his candidacy by rumors that he has had relationships with other women during his 28-year marriage to Lee. He has insisted that the rumors have no basis in fact and, in an interview with The New York Times, challenged those who question his fidelity to follow him. He said the assignment would be boring.